Say Fortnite is popular is like saying the ocean is wet. It’s the hottest game to hit the market in years, with more than 125 million players worldwide more than 40 million people logging in to play Fortnite each month. One 14-year-old boy, Griffin Spikoski, who spends eight hours a day playing, has literally gone pro with his Fortnite skills, earning $200G playing the game and uploading clips of himself playing to his YouTube channel. Though the game itself is a free download, like many games, there are in-app purchases available. “V-Bucks,” the in-game currency – allows players to buy items and “skins” which is Fortnite lingo for how the players look in the game. Individual purchases cost only a few dollars, but with millions of players worldwide, it’s no surprise Fortnite is earning $300 million a month or that scammers are eager to get in on the action. V-Bucks generators are probably the biggest online Fortnite scam. Players are promised “points” for watching or clicking on ads, with the promise that the points can be traded in for free V-Bucks within Fortnite. Epic Games – Fortnite’s developer – warns these websites have no affiliation with the game, and that often, these sites are phishing for the player’s Fortnite username and password or they push them to take surveys where they submit personal data to prove they’re not a bot. These fake sites often mimic Epic Games’ and Fortnite’s style, colors, and fonts and often include “Fortnite” in the URL. Of course, social media is another popular venue for scammers. 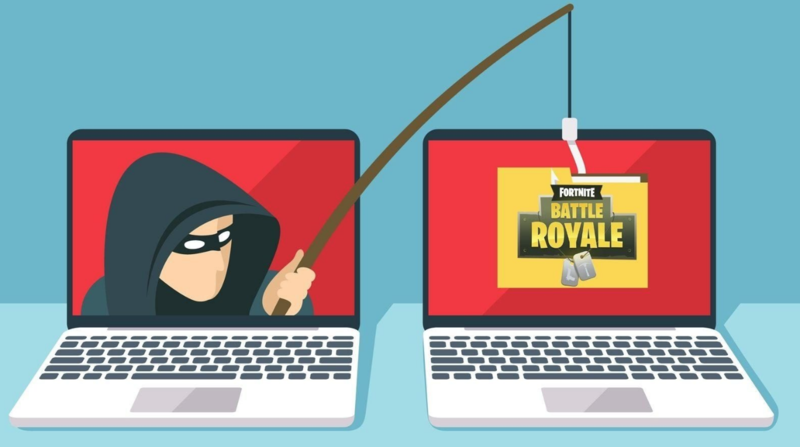 Fake Facebook pages, YouTube Channels, and V-Bucks generators encourage players to share their links to earn more points, which spreads the scam to a bigger audience. Often, they direct unsuspecting users to unsafe apps and malware that also target players personal information. Because Fortnite is not offered in the Android app in the Google Play Store, it wasn’t long before fake versions of the apps appeared. These too are malware sites mining for personal data. Tell them to always check with you before filling out forms, quizzes, registration pages, on websites or apps including Facebook. Many times it’s data-mining masquerading as fun. They should also be reminded that PlayStation, Xbox, Epic Games’ official website, and the official Fortnite app are the only places to buy V-Bucks. If they see another option that seems too good to be true – it’s a scam. Finally, teach them to pay attention to secure websites and check the URL of any site they visit. Scammers are smart and make domain names and URLs look very similar to the real site, often with only one letter or symbol different from the original, so they need to pay attention. Tracey Dowdy is a freelance writer based just outside Washington DC. After years working for non-profits and charities, she now freelances, edits and researches on subjects ranging from family and education to history and trends in technology. Follow Tracey on Twitter.